Suppose you’re building a widget that performs some simple action, which ends in either success or failure. You decide it needs to succeed 75% of the time before you’re willing to release it. You run ten tests, and see that it succeeds exactly 8 times. So you ask yourself, is that really good enough? Do you believe the test results? If you ran the test one more time, and it failed, you would have only an 72.7% success rate, after all. So when do you have enough data, and how do you make the decision that your success rate is ‘good enough?’ In this post, we’ll look at how the Beta distribution helps us answer this question. First, we’ll get some intuition for the Beta distribution, and then discuss why it’s the right distribution for the problem. Beta distribution for 8 successes and 2 failures. The blue curve is the probability density function P(x=μ|s, f). The expected value for μ is 0.8 (marked in black). The green line indicates 90% certainty that mu is greater than 0.633. 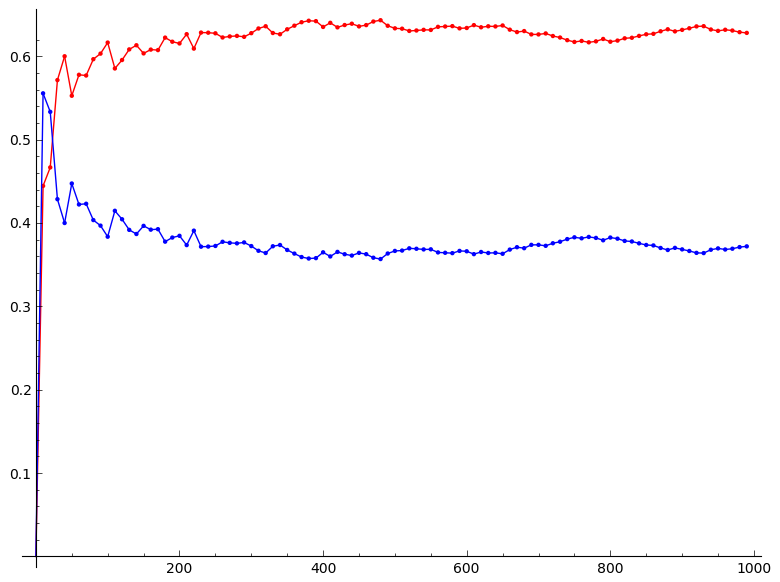 The red curve is the cumulative density function, which is useful for finding confidence bounds. 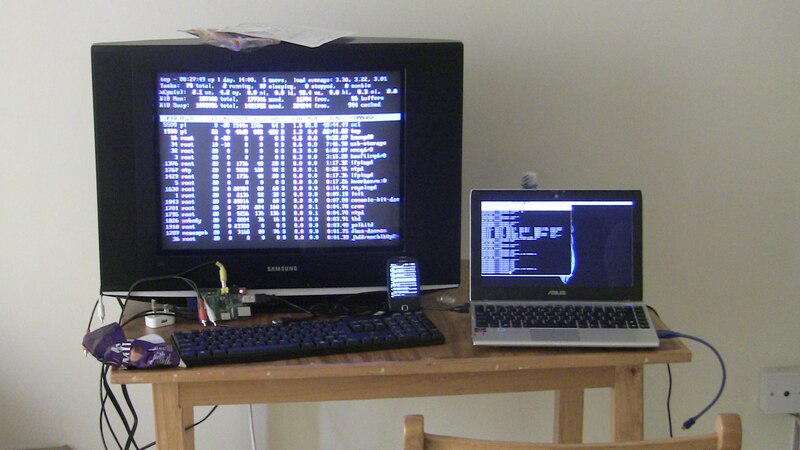 My laptop, android phone, and a Raspberry Pi plugged into a crappy hotel TV, all running terminals. This happened while trying to compile Sage on the Pi in January, 2012. This week I’m at the IMA workshop on Modern Applications of Representation Theory. So far it’s been really cool! So, off to the races. I’m going to skip the really, really basic ones, like ls, cd, apt-get and sudo. In fact, there’s a nice tutorial at LinuxCommand.org which covers a lot of the basics, including IO redirection. Finally, I’m assuming that one is using the bash terminal. Back in late December, I planted a Raspberry Pi camera at a cottage on Georgian Bay, in Northern Ontario, set to take a picture once every two minutes. I had been planning the shoot for a couple months prior to the deployment: There were two Raspberry Pi’s involved, in case one failed somewhere during the winter. One of the Pi’s was set to reboot once a week, just in case the software crashed but the Pi was still awake. I had also written some software for the time-lapse to ensure that pictures were only taken during the day time, and to try to maintain a balance of well-lit, consistent images over the course of each day. In spite of all the planning, I had a sense that something would go horribly wrong, and, indeed, when we showed up to the cottage, the windows were completely frosted over. The cameras had to be placed inside, so we figured we would mainly see the back-side of an icy window when we retrieved the cameras. Or that the camera boards would literally freeze after about a week of sub-zero temperatures in the unheated cottage. Or that a raccoon would find it way in and gnaw through the shiny Lego cases. Or something else entirely unplanned for. So it was a bit of a surprise when it turned out that the shoot went perfectly. We retrieved the cameras about a week ago, on May 7th, and found over 42,000 photos waiting for us on one of the cameras and somewhat fewer on the other. Both cameras had survived the winter just fine! All told, I think the result was really cool! The video at the top is the ‘highlights’ reel, with all of the best days. It comes to 13 minutes at 18 frames per second. Turns out it was a fantastic winter for doing a time-lapse, with lots of snow storms and ice. There’s even the occasional bit of wildlife, if you watch closely. I’ll post the full 40-minute time-lapse on Youtube sometime next week. Here are the slides from the talk I gave in Montreal last Friday. The talk was about using Fourier transforms to get polynomial-time encodings of permutation statistics, as well as a look at the Kondor-Borgwardt approach to graph invariants via the Fourier transform over . The talk was given at a representation theory conference, and I was making the point that we can get new research ideas by taking trips into the world of applications – in my case, by looking at machine learning problems. The opening joke was that I asked my computer for the best possible title for the talk, and received the click-bait title as a response. 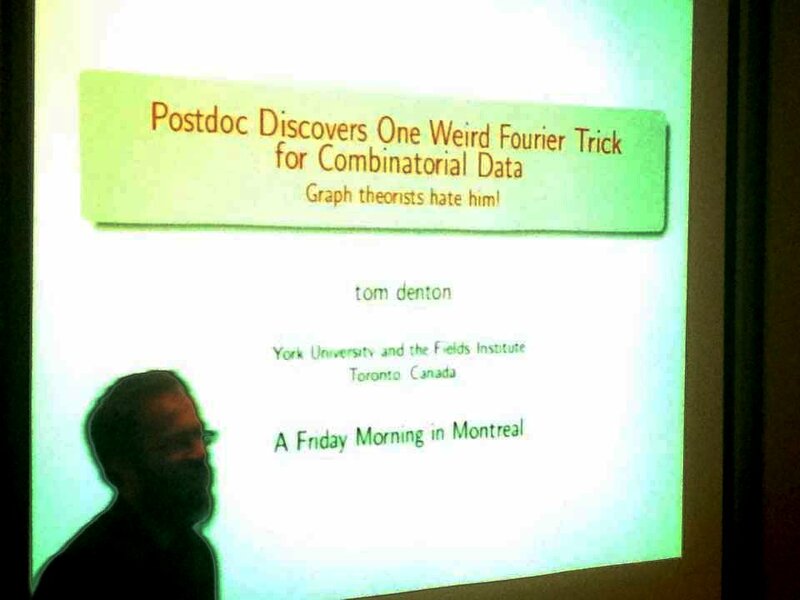 It was admittedly a pretty funny moment watching the chair of the session trying to decide whether to read the title originally submitted for the talk (‘Compressed Combinatorial Statistics’) or the ridiculousness on the screen (he went with the original). I’ve finally had a bit of time to finish up the code for the Rock-Paper-Scissors bot discussed in the previous posts; I’ve put the code in a GitHub repository here. Feel free to file issues if you would like it to be a bit more user friendly. Win percentage over time, Diaconis vs Switchbot. As time increases, the win percentage settles in on 2/3’s which is a natural limit for play against Switchbot. The bot which uses the Fourier transform on move probabilities to search for profitable patterns is named `diaconis`, after Persi Diaconis. It’s currently working just fine, but is a bit slow computationally. On startup, it generates all possible move patterns that it will investigate during the course of each game, as well as some character tables. After each play, it tests some of these patterns, and tries to determine if their predictive power is better than any of the patterns seen thus far. If so, it begins using that pattern to choose move probabilities. This works fine as a proof-of-concept of the basic ideas. Additional improvements could be had by doing some code optimization to speed things up a bit, and keeping a list of good patterns and allowing a bit more dexterity in switching between the patterns used for prediction.